The VizieR query dialogue can be opened using the VizieR Catalogue Service button ( ) in the Load Window's toolbar or the Control Window's VO menu. It allows you to make queries directly to the VizieR service operated by CDS. 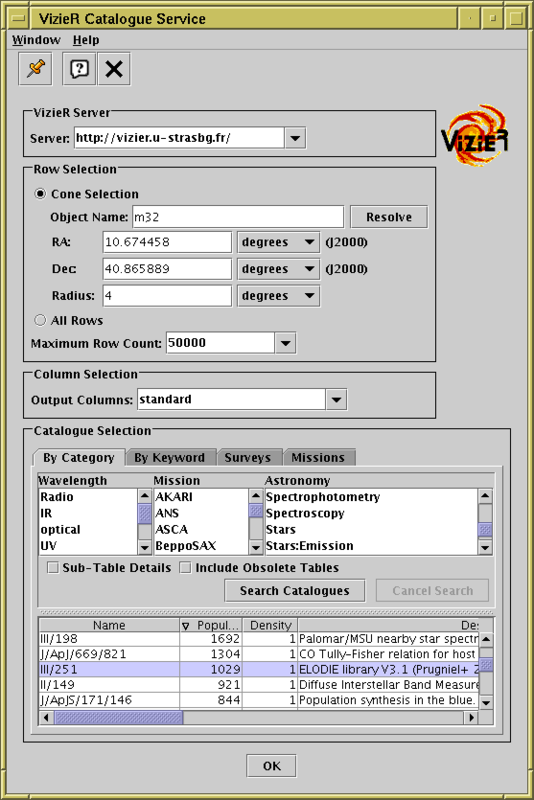 VizieR is a comprehensive library of very many published astronomical catalogues. These items can equally be accessed from the web or other interfaces, but this load dialogue makes it convenient to load data directly from VizieR into TOPCAT. Note that VizieR's idea of a catalogue is more complex than a single table; this means that in some cases querying one of VizieR's catalogues may result in more than one table being loaded into TOPCAT (the Sub-Table Details checkbox described below can help to control this). The dialogue consists of four parts: the VizieR Server, Row Selection, Column Selection and Catalogue Selection panels, arranged top to bottom in the window. These are described below. The VizieR Server panel allows you to specify which VizieR server you want to use for data download. By default the server at CDS is used, but there are mirrors elsewhere, whose URLs can be chosen from the selector. If you see a popup window complaining that the server cannot be contacted, you can choose a different one; you might also want to select one that is close to you for performance reasons. In this case you must give a central sky position and the search radius to define a cone-shaped region of interest. Rows within that range will be returned. For the central position you can either fill in the RA and Dec fields directly, or you can fill in the Object Name field and hit the Resolve button; in the latter case, a SIMBAD query will be made to determine the coordinates corresponding to the named object. Alternatively, you can choose to download the whole catalogue without spatial restrictions. In either case, the Maximum Row Count selector indicates the largest number of rows which will be returned. If your query requests more rows than the limit given, extra rows will simply be omitted from the returned result (the limit seems to be approximate). It is possible to choose any value for this field, including very large ones or the special value "unlimited"; however consider before doing this whether you want to download a potentially very large data set. The server may in any case time out in the case of a very long connection, so it is probably not possible, even if it were desirable, to download for instance the entire 2MASS point source catalogue. Contains a selection of those columns considered most interesting by the service. Contains the 'standard' columns plus numeric "_RAJ2000" and "_DEJ2000" positional columns inserted by the service; if the query is a Cone Selection rather than All Rows, it also contains a column "_r" inserted by the service giving the distance between the selected position and the row's position. Contains all the columns from the archived catalogue. VizieR experts may fill in custom column requirements here by typing them into the selector box rather than choosing one of the predefined options, for instance -out.add=_GLON,_GLAT would add galactic coordinates to the standard set; see http://vizier.u-strasbg.fr/doc/asu-summary.htx for more details on VizieR hacking. (In fact, this trick can be used to add VizieR parameters unrelated to column selection as well). You may select one or more terms from one or more of the presented lists of predefined keywords in the categories Wavelength, Mission and Astronomy to restrict the catalogues that you are interested in. How you select multiple entries from the same list is platform-dependent, but CTRL-click may work. When you have made your selections, hit the Search Catalogues button, and those catalogues in the categories you have identified, and with coverage in the region defined by the Row Selection panel, will be listed below the category selection panel. Select one of these by clicking on it. The Sub-Table Details checkbox controls whether the list displays only top-level VizieR catalogues (each of which may contain multiple tables) or entries for each table within each catalogue as well. The Include Obsolete Tables checkbox controls whether just the most current, or all versions of each catalogue are shown. A Keywords text field is shown; you may enter a space-separated list of words which will be matched against catalogue names and descriptions. When you have entered the search terms, hit the Search Catalogues button, and those catalogues which match your terms, and with coverage in the region defined by the Row Selection panel, will be listed below the Keywords field. Select one of these by clicking on it. The Sub-Table Details checkbox controls whether the list displays only top-level VizieR catalogues (each of which may contain multiple tables) or entries for each table within each catalogue as well. The Include Obsolete Tables checkbox controls whether just the most current, or all versions of each catalogue are shown. A (fairly short) list of large surveys held by VizieR is presented in a table. An indication of the size of each, in terms of number of thousands of rows, is given. Select one of these by clicking on it. A (fairly short) list of data holdings at VizieR originating from large missions is presented in a table. An indication of the size of each, in terms of number of thousands of rows, is given. Select one of these by clicking on it. When you have made your selection of rows, columns and catalogue you can hit the OK button and TOPCAT will attempt to contact the VizieR service to load the resulting table or tables. You can cancel a request in progress with the Cancel button. If the access to catalogues with VizieR was helpful for your research work, the following acknowledgment would be appreciated: "This research has made use of the VizieR catalogue access tool, CDS, Strasbourg, France". The original description of the VizieR service was published in A&AS 143, 23 (2000).